The Transcontinental Railroad Back Country Byway represents an epic achievement in American history, linking East to West in the new nation. Today the landscape looks much the same as it did in 1869, but the rails, the towns, and even the lonely rail sidings are gone. Now the visitor can only imagine the vision and effort of those who struggled to build the nation’s first transcontinental railroad. The Central Pacific Railroad began laying track east from Sacramento in 1863. After tackling the rugged terrain of the Sierra Nevada Mountains and crossing the Great Basin, the railroad reached Utah in March 1869. The Byway follows the last 90 miles of grade laid by the Central Pacific before their rails met the Union Pacific’s at Promontory Summit. As you travel west from Golden Spike National Historic Site, you can see two parallel grades. In an effort to reap greater government subsidies, the two competing railroads laid grade along side each other for over 200 miles. Today cattle graze where once thousands labored to open the West to industry and commerce. The Transcontinental Railroad Back Country Byway is interpreted at over 30 sites along the grade. Enjoy the past as you travel this route on Utah’s public lands. 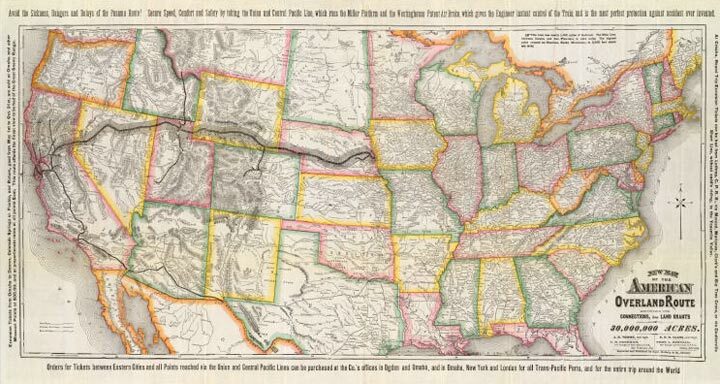 Public lands are continually being reconsidered in this region and it wouldn’t be completely unrealistic to see one or more sections of the Transcontinental Railroad Route re-routed for motorized vehicles or closed all together. We will attempt to update this article as often as possible, if you see a change we have not addressed, please let us know. Lastly, always check with state and federal land management agencies prior to embarking on a trip. Promontory to Lucin: This route follows the original railroad grade nearly the entire way between Promontory to Lucin, passing a handful of now ghost towns reminiscent of the past. Lucin to Wendover: This section follows a high speed graded dirt road from splitting from the Transcontinental Railroad Route at Lucin and heading south ending back on the highway near the Bonneville Salt Flats and Wendover, Utah. The majority of the route from Promontory, Utah to Wendover, Utah is passable in 2-wheel drive however wet weather can make it impassible to even 4WD vehicles. Camping Areas: This area is open to primitive camping throughout the BLM land. As this area is rather exposed, campsites with shelter from the desert winds are few and far in between.